Searching for Bonobo in Congo » Welcome to our new site ! This is not Terese writing, but Kim Gjerstad. More on me below, but first about the redesigned blog. This new site has been in the works for the last three months and was a group effort between Terese, Daniela (theme designer), Sarah Hart (daughter and consultant), Colleen (logo and photo in the header) and myself (geek on hand)[insert from Terese:=my right hand]. Our sophisticated maps are produced with the help of Maria Carbo Penche as well as Nick January, of the Canadian Ape Alliance (CAA page on our project). We decided to go solo, and get our own site after more than a year on WildlifeDirect‘s blog platform. Their support and help in blogging was a great launch pad for our blogging endeavor. Many thanks to them for creating this opportunity for us, and other conservationists. What does this blog mean to us? Above all, the blog is a window for our supporters, followers, family and friends. It is a peek into a very isolated part of the world that very few people get to see, including the Congolese. Moreover, it’s a special opportunity for Terese Hart to share her Congo experience, one that started in the early seventies. When we decided to start a site, we made a last minute decision to invest in a bgan (see insert in right column). I managed to convince Terese to spend 1000 dollars on the satellite dish, and we’ve been rolling since may 2007. Seventy posts later, we have a small audience of 500 visitors a week. Building this blog to this stage has been an exciting challenge. It’s a common effort with the field staff who provide stories and photos. Sometime discoveries, like the mystery monkey. Sometimes we even have epiphanies, like the photos by Ashley of his first sighting of wild bonobos after nearly two years of surveying them. 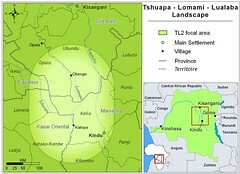 A rare opportunity that turns out to be quite easy in the Lomami ! This just tells you how alive the forest is in this part of Congo. As for me, Kim, I worked with John and Terese Hart during one of the five years I spent in Congo. I was a communication consultant for them. That was in 2005 and I haven’t stopped working with them since. Why? Simply because they are scientific (a rare occurrence in the conservation world), they work to the limits of the budgets they have, and they respect and believe in their Congolese colleagues. And most importantly because they are modest human beings. If you can help them, believe me, your money will not be wasted in their hands. This entry was written by Terese Hart, posted on 2008-09-08 at 1:36 am, filed under About the project. Bookmark the permalink. Follow any comments here with the RSS feed for this post. Post a comment or leave a trackback: Trackback URL. I love your new site, it looks great! I’ve subbed to the mailing list and looking forward to more updates. Congratulations! Thanks Sheryl — and as it is new there still might be some bugs. Please, please don’t hesitate to tell us if something seems not quite right. Well done Kim and everyone in getting the new site set up, it looks great. Beautiful site and congrats on your decision to go solo! I have always really enjoyed reading your posts (although somewhat always depressing…but c’est comme ca la vie en Congo). Will put this up on my bloglist. Impressive work Mama and Kim this website is sophisticated, easy to navigate, and fun to use. I am working my way through it during the the wee hours of the morning as I keep Heneem company during her waking hours. It’s one of the best on the web, congratulations.